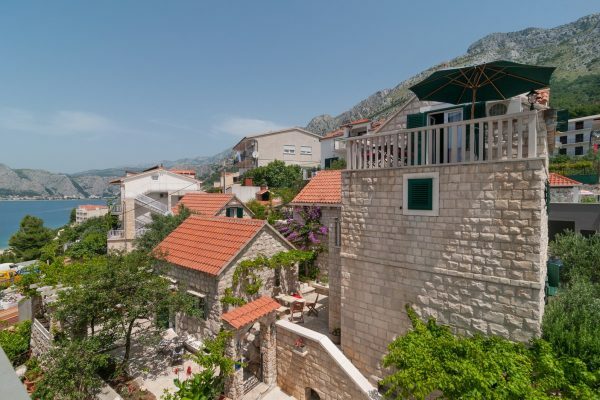 OM1361IV – An amazing villa for sale Omis is situated in a nice and quiet area on an elevation, in wonderful natural surroundings with amazing and open views of the sea. The villa for sale Omis consists of a ground and the first floor and features a big yard with a beautiful pool on the ground floor level, with four en-suite bedrooms altogether. The ground floor has a total surface of 200m2 and it includes a lobby area, an en-suite bedroom, a hallway, a storeroom, a kitchen, a toilet, a dining room and a 28m2 living room; the outside space includes a nice yard and a 36m2 pool with a spacious sundeck and superb views of the sea. The first floor has a total of 50m2 and it features three en-suite bedrooms. From each room of the house you have access to the ground floor terrace, which is an excellent advantage. The house was nicely designed by an established architect and features beautiful and modern designer furniture. This beautiful property features a 821m2 plot of land and it is situated in a pleasant area close to the city of Omis and all the necessary amenities. From here you have only about 300 meters to the crystal-clear sea. This is an excellent new property, perfect as a luxurious holiday home as well as for renting out. The city of Omis is just about 15 kilometres away and Split is about 40 kilometres from here.